Tea Eggs - TSA-DANg always bring back the childhood memory of picnic under the Cherry Blossom trees. Spreading a sheet under the cherry trees with their extended branches covered with thousands of blossoms. All dressed up in soft white petals with pink tips. Swaying in the soft spring breeze and watch the petals softly fall on our picnic. It's our spring Cherry Blossom family field trip organized by my father's company. I really enjoy the view of beautiful cherry blossom, and all the great food our mother had prepared for us. 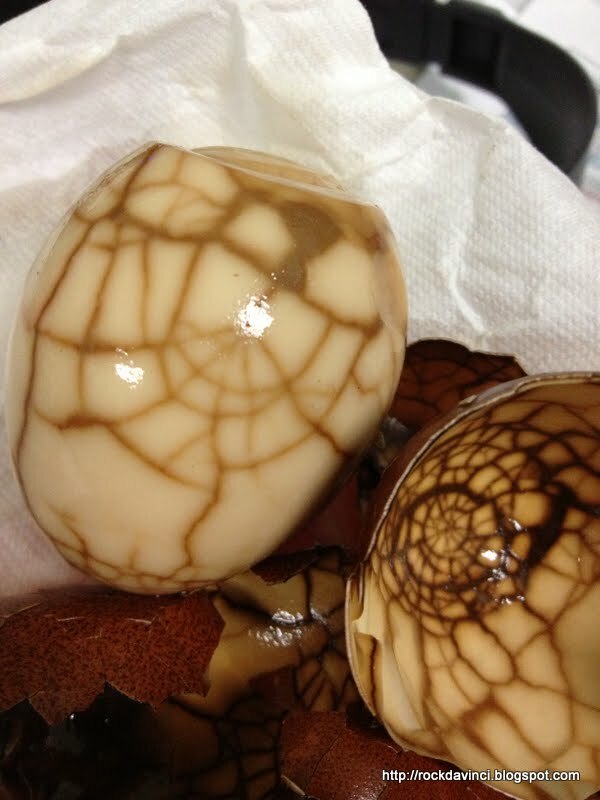 And never miss the Tea eggs. 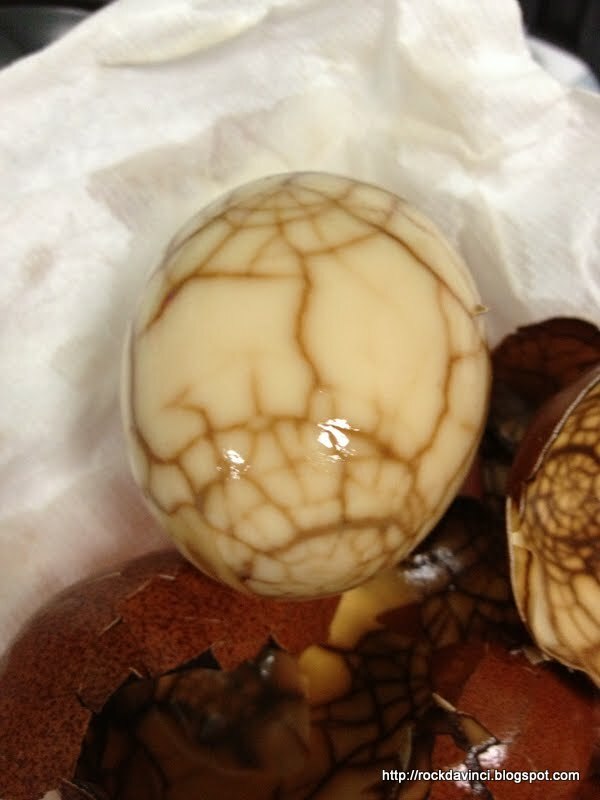 Tea eggs are hard boiled eggs infused and seasoned with tea leaves and spices. Not only does the cooking method add different dimension to the taste of regular hard boiled eggs, it can travel far without refrigeration for many hours. Following the Chinese custom of 'sharing' - give and take and give - they are often shared with other families at the picnic. 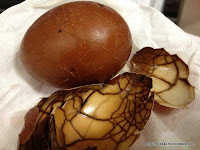 Almost every family has brought the tea eggs. I noticed the silent competition amongst the housewives when they share the tea eggs. They quickly judge which one has been successfully brewed and infused with tea as they peel the shells off while thanking the other family for sharing, and taking a bite. So what are they judging? It's the beautiful spider web like pattern imprinted on the egg whites that they are looking at. So, try it. It's spring. Enjoy the outdoor. Since I don't have a photo of my own picnic under the cherry blossom, here is the link to the Google Images of all the HANAMI celebration of spring Cherry Blossom. Bring to boil 5 - 6 Cups of water (enough to cover the eggs - depending on the size of your pot), then simmer for 15 minutes. Remove eggs. 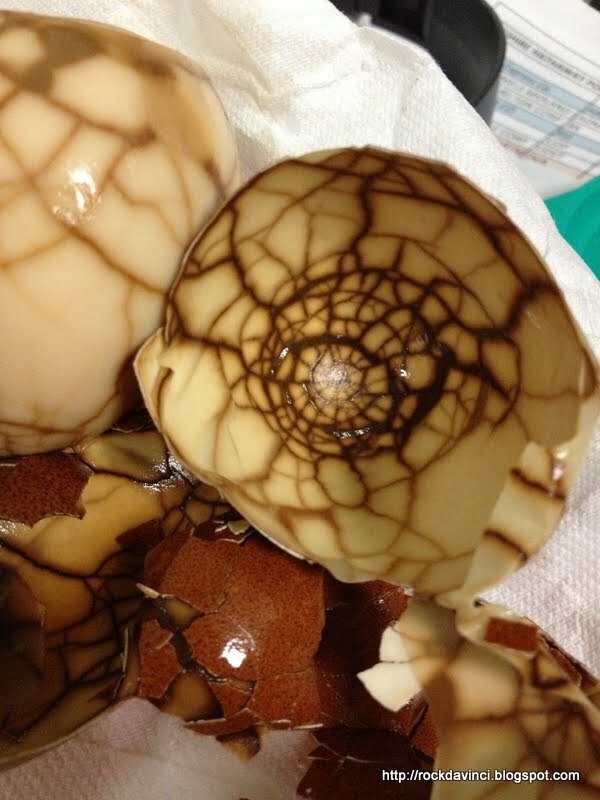 Create Egg Shell Cracks - Lightly tap egg shells to create cracks all around - but do not remove the shells off the eggs. This will allow the flavor to infuse into the eggs during the next step of boiling in the tea mixtures. Create a large Sachet bag to hold all ingredients if you prefer. Otherwise boil all ingredients loose in a pot. Bring 7 C of water to boil. Add all ingredients. Add cracked eggs and simmer over low heat for 1 hour+. Bring one out and peek under the shell - is it beautiful? Then, Done! Cool and refrigerate overnight to infuse the flavor deeper.